A member of the narcissus family (Amaryllidaceae) that includes daffodils and jonquils, the paperwhite is an easy-to-grow indoor/outdoor favorite. The bulbs of the paperwhite narcissus are somewhat smaller than the bulbs of daffodil or jonquil. Also, the blooms are smaller in size but bigger in fragrance, being among the most pleasantly pungent of any of the flowering plants. 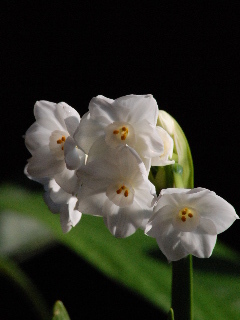 Though native to Europe and parts of Asia and Africa, paperwhite narcissus has become such a popular flowering bulb that its cultivation has spread to include almost worldwide acceptance. Paperwhites are especially popular and plentiful around the time of the Thanksgiving and Christmas holidays, being one of the easiest bulbs to “force” into bloom. They are often given and received as gifts during this time; and a welcome gift they become—their sweet smells and bright blooms brightening up the dark gloomy days of winter before the springtime begins. Place the bulbs in a shallow glass container that has been filled about half full with colorful pebbles. Set the bulbs into the pebbles just firmly enough so they will not be jostled about or lose their footing as the plants produce top growth—about one third of the bulb should be anchored into the pebbles with the remaining two thirds of the bulb exposed, pointed end up. Put enough water into the container so that the bottoms of the bulbs just touch the water and can drink from it. Maintain water at this level by adding as evaporation occurs and as the plants drink it up. Avoid having much more than just the bottoms of the bulbs touching the water, as excessive water depth can cause rotting of the bulbs. Place your container of paperwhites in a bright (but not direct sun) location. In a matter of just a few days, roots will descend downward into the watery, pebbly, glass container, and dark green foliage will ascend upward on its way to the production of your desired goal—delicate looking, sweet smelling paperwhite blossoms. Expect this miraculous journey to take anywhere from 4 to 6 weeks, from anchoring the bulbs to smelling the blooms. Turn your container of bulbs every couple of days as the tops grow, to allow for the tendency of the foliage to pull toward the light. The top-growth of paperwhites has a tendency to be rather long and leggy, anyway. 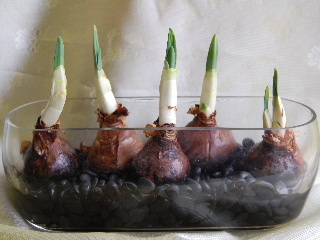 One way to impede the legginess of the foliage is to add rubbing alcohol to the water in which the paperwhites are growing (don’t overdo it; about one part alcohol to ten parts water seems to work). The alcohol slows the growth of the foliage, but does not diminish the size, fragrance, or quality of the blooms. After your paperwhites have finished blooming, you may want to allow them to dry out and plant them into your outdoor garden after all danger of frost has past. This is fine, but don’t expect any real blooms from these bulbs for a year or two as they re-build their storage of food and acclimate to the outdoor setting. The better way to have healthy, happy, paperwhite narcissus growing and blooming in your outdoor garden is to plant the bulbs directly into their outdoor setting in the fall of the year, as you would any other spring-flowering bulb. Locate them in a sunny site and plant them about 4 to 6 inches deep in loose, organically rich, soil. Paperwhites are not as tough as daffodils, tulips, or other bulbs when it comes to withstanding extreme cold and prolonged freezing temperatures. Cover the planted bulbs with 3 to 4 inches of mulch to get them safely through the winter. As temperatures warm in the spring, pull back some of the mulch, and get ready for the welcome addition of sweet smelling paperwhite narcissus blooms in your spring garden.